People have done crazy things for charity, others have done impressive things, a grand majority have done uninteresting things and then Simon Griffiths did an odd thing. But before that, he had a really great idea. Before Griffiths' recent and odd charitable decision, he founded the toilet paper company Who Gives a Crap. If it seems that the confrontationally-titled bathroom tissue company is trying to get your attention, it is. Who Gives a Crap takes its business model very seriously, and you should too. For every roll of toilet paper you buy, 50 percent of your money goes toward the construction of new toilets in a number of developing countries. The other half of Who Gives a Crap's business model is much simpler. Just as roadwork will never stop being a necessity, toilet paper has some of the best job security among bathroom products - it's guaranteed to sell. Griffiths and his company just want to make sure it sells well by producing the best and softest recycled toilet paper ever. But to launch the business itself, Who Gives a Crap is going to need some money. That's where the odd charity movement comes in. Or, rather, lack of movement. Griffiths, who has reddish-blonde hair, a bearded face and understandably haunted eyes, makes an appeal from a toilet in a video on his indieGoGo campaign page. Until his company is able to raise the $50,000 they need to start helping sanitation in developing nations, he won't get up. And as we all know, that means the poor guy will be dealing with some awful pins and needles in his legs. It's been well over a day already. "I'm sitting down for what I believe in," Griffiths deadpans in his video. And though his pants are around his ankles, he looks a little ridiculous in his sandy sports jacket. While it's rare 10 seconds go by without as many puns, it's clear that he and his enterprise are in earnest. So, whether you're a campaign contributor or not, it's certainly worth keeping an eye on Who Gives a Crap. Cleanly operating bathrooms are a vital part of a functioning society, so Griffiths' company's proposed charity could make a huge difference in the world. 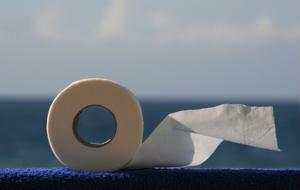 There's no shortage of need out there, either of toilet paper or helping hands.